Solid Hookups: Company Party...Any Fish Out There? Company Party...Any Fish Out There? Several times each year the guys I work with throw a shindig and we all get together to drink a few beers, eat some grub, and mingle with eathother's families. The last trip found us on the ice in January on Great Pond. 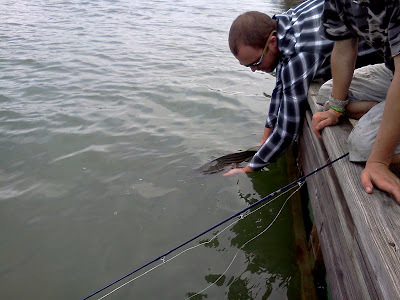 We managed a few nice Pike and had a great time; this trip came together last minute and we all joined forces at Chris Burtis' place along the ocean in Brunswick where the New Meadows River meets the sea. Chris and his wife purchased the house last fall and he had flogged the water without any fish coming to hand. 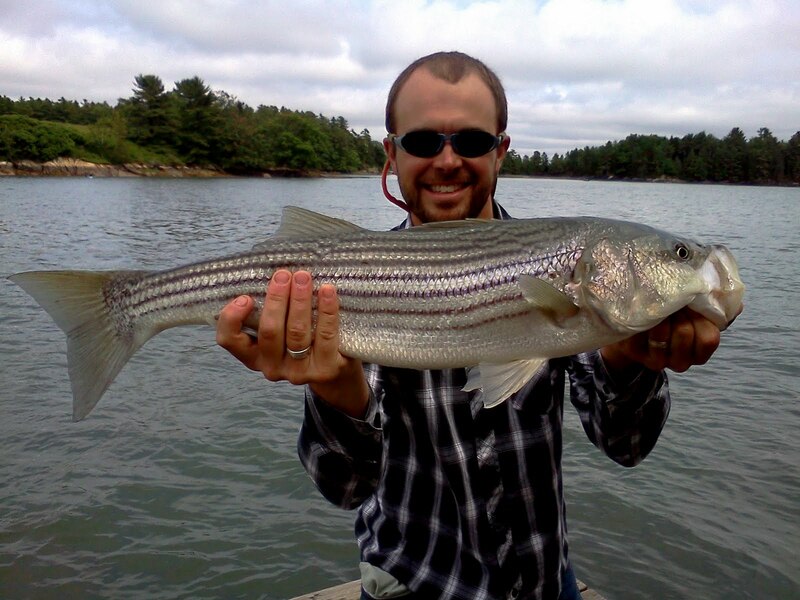 Reports of Alewives busting around high tide were fresh in my brain but stripers have eluded me for several seasons. Bottom line, he and his two sons ages 10 & 12 wanted to know if it was possible to land a striper or if their attempts were a waste of time. Four men with extensive striper experience settled into their fishing formation at around 3p.m on the incoming tide. A few rolling fish got our blood flowing and it wasn't long until the wand in my hand went tight on a Peanut Bunker pattern. 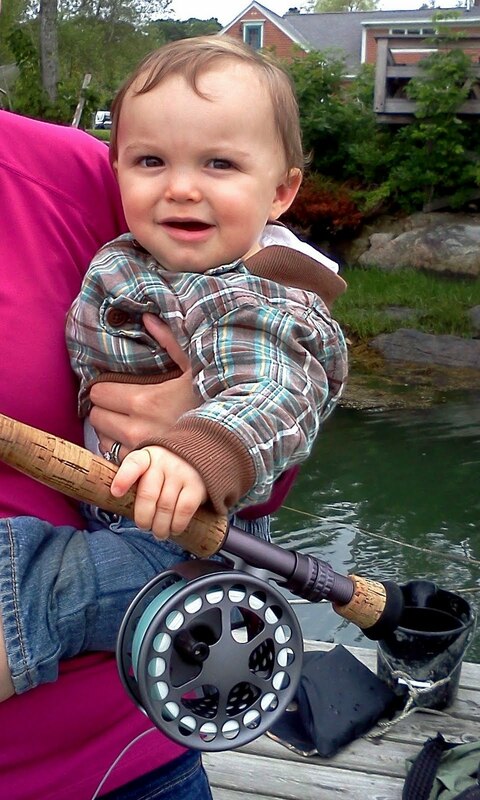 Chris was beside himself and to be honest, a 30 inch fish on the fly in Maine will put a smile on my face any day. Troy poked around in his canoe with his daughter and managed to sting a fish on the fly that threw the hook. Others heaved top waters and soft plastics on spinning gear with little luck. One of my co-worker's 7 year old daughters struck next on a closed face zebco rod with a bobber and a bloodworm. The fish was large and the equipment too small, line broke, Amelia excited and undeterred kept on fishing. 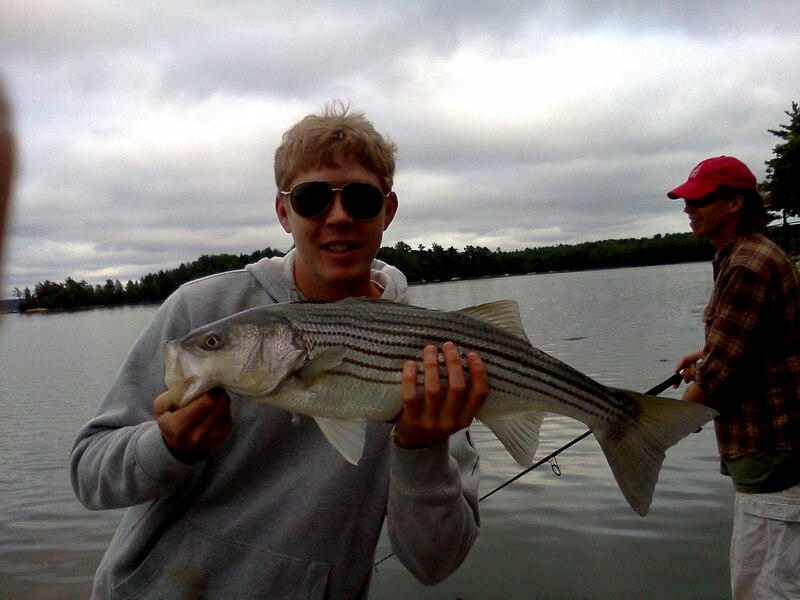 Max, another guy on my crew struck next on a soft plastic....2 fish to hand. At this juncture the tide reached high slack and the fishing slowed. I hooked another fish that put on a nice 50 yard drag peeling run and threw the hook as it turned directly back in my direction. 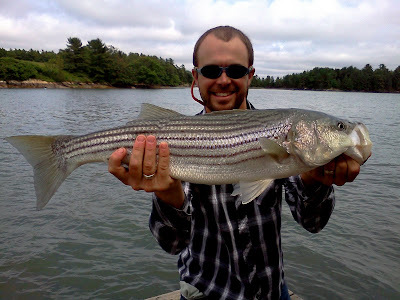 Maine stripers CAN still be caught, it just so happens that Chris's compound is a 30 yard hoof to his prime water dock, something I am quite jealous of. I will be back and River is giving it strong consideration!